November in San Diego is always gorgeous and we can still enjoy warm weather and clear skies. The tourists for the most part have gone home and we have our city to ourselves… That is until the Food and Wine Festival happens. 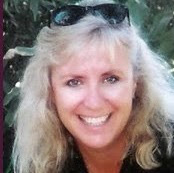 People come from all over the USA to attend Southern California’s largest and most talked about food and wine festival. This is the chance to experience firsthand the culinary genius of our city’s chefs, as well as the delicious wines that local and regional winemakers are crafting. 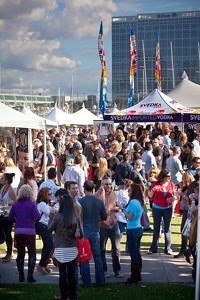 With Coronado Island and the Bay Bridge as a back drop, Embarcadero Marina Park, directly behind Seaport Village, is the perfect location for the festival’s finale, the Grand Tasting. Feel the ocean breeze as you walk through the grounds listening to music, tasting food and wine, chatting with winemakers and chefs. 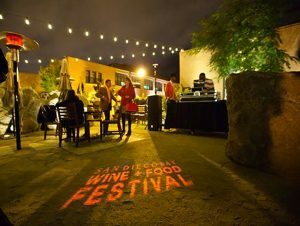 The Grand Tasting is the finale of a 7–day epicurean delight—a food and wine (and this year beer) lover’s paradise, that showcases 170 wine and spirit purveyors and 70 of San Diego’s top chefs. Temecula wines were well represented. Callaway Winery, South Coast Winery, Wilson Creek Winery and Danza del Sol Winery and Europa Village were showcasing some of their latest releases. While you only get a small taste of beer, wines and hard alcohol, many participants follow-up by going out to breweries and wineries and experiencing full tastings. While this has traditionally been solely a wine festival, this year because San Diego has become a craft beer mecca, beer tasting was added to the fest. The first week of November, the city celebrated Beer Week. Brewers continued to educate participants of our burgeoning craft beer industry. 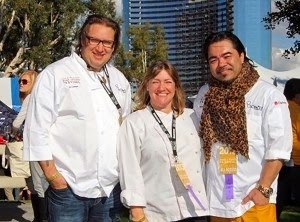 The city’s most talented chefs vie for the Chef of the Fest Competition, during the week. The winner is announced at the Grand Finale. This is a great opportunity for local chefs to compete with their favorite recipes and get their name known around town. Chef Rich Sweeney, from R-Gang Eatery and the soon-to-be-opened Southpaw Social Club was crowned “Chef of the Fest”. He won the competition with his Duck Fat-Fried Beignets with Burnt Orange Cream, Smoked Duck “Dust” and Crispy Glazed Duck Skin. The cash prize of $50,000 and other prizes will come in handy for him as he starts his new restaurant in downtown San Diego. The entire week of this event includes cooking demonstrations, a Fit Foodie 5K run, a variety of wine tasting seminars and a sliders “take down”. In total there were 25 culinary and beverage events held throughout San Diego. Southern California is becoming known for more than just great weather and good surf. Now we have an emerging wine region, talented craft beer brewers and a plethora of talented chefs tempting and satisfying our palates.